Most of the brands that use PRICEFY have one problem in common, they don't know what's going on their sales network. Unauthorized resellers, fraudulent eCommerce stores, incredibly low priced products are all part of the same problem: being able to easily monitor the brand unofficial sales network. Using the PRICEFY resellers discovery tool you will be able to catch every eCommerce store that is selling your brand's product on internet. 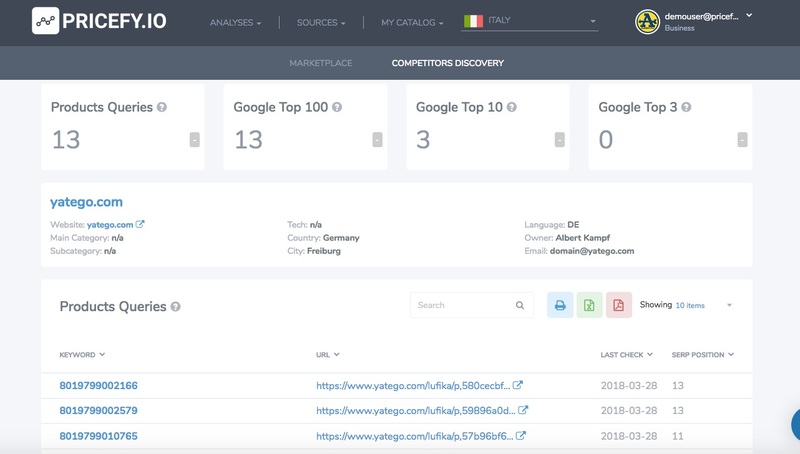 For each reseller, PRICEFY will show you all the URLs retrieved, grouped by domain and the Google SERP position for that particular query (EAN/UPC/Product Name) so you can better understand how well positioned is that eCommerce store. PRICEFY will perform a new search every week so you will be constantly updated about every new reseller will appear on the scene.